Do you have only one computer at home? Actually, sharing a home computer between different members of a family can cause certain problems. When your children need your home PC to play games and your wife likes to chat with friends online, it may seem that you will never have enough time to organize your work. IBIK company knows how to share one computer between several users and expand your computer usage. We are proud to offer you ASTER shared computer access software allowing to share a home computer without any hassles. Whether you are using your PC for work or just for the entertainment, sharing a home computer with ASTER will eliminate fighting concerned with your PC use. Our powerful software to share a computer allows you to set up two computer workstations on the basis of just one system unit without requiring additional hardware. When you share a home computer, you will save your money as well as space in your apartments because there is actually only one computer box (an ordinary desktop or laptop). 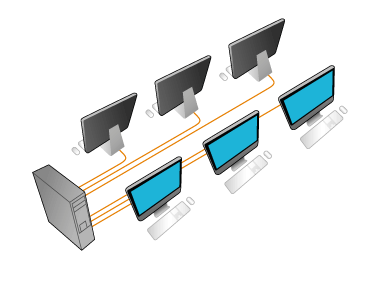 ASTER doesn't use thin clients and terminal stations for sharing a home computer and working on two monitors independently and simultaneously. Additionally, while being a rather affordable way to obtain another workstation at home, our advanced software to share a computer is easy-to-operate. So, if you have one more mouse, monitor, keyboard and video card, you will easily learn how to share one computer for several users and equip a second workstation with minimal costs. Undoubtedly, the typical home user will appreciate our full-functional software to share a computer for extensive home usage. However, if you are looking for commercial use, be assured that this advanced application to share a home computer can be successfully applied for office equipping as well. In any way, knowing how to share one computer between several users, you can cut down your electric power consumption and hardware costs while benefiting from its great performance.